They have the head of a crocodile and the body of a dragon. Once they lock onto prey with their jaws they will never let go. There is a line of sharp protruding bones on their back stretching to their tail. Some bigger ones even have a long horn on their head and a pair of short wings. However, they can't fly. They have a pair of big eyes that can look every which way. Take care of yourself. They always attack others with their powerful tongue. These tropical reptiles are very colorful. 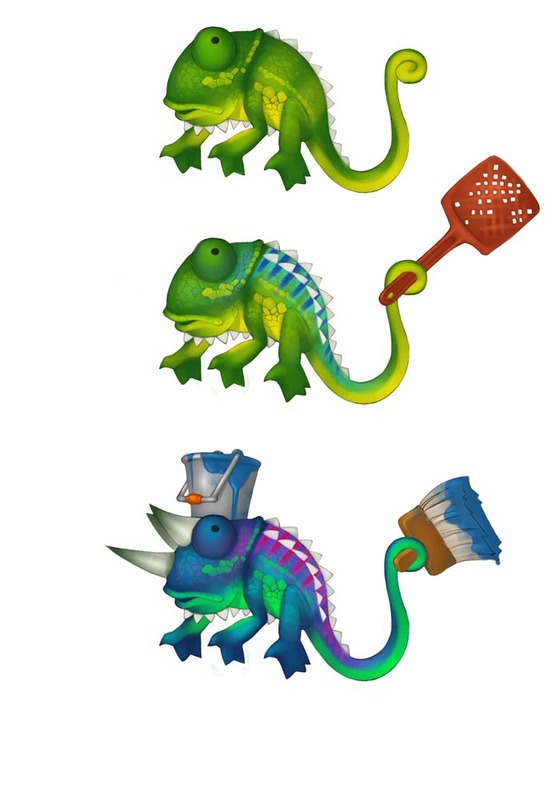 Some stronger chameleons may attack others with their paintbrush or flyswatter. Their big mouth and sharp teeth scare everyone nearby. Their leaves are as sharp as hooks. Because they have killed a lot of people and absorbed their nutrients, two smalls heads have grown on their hands. All the heads are always slobbering and seem very hungry. 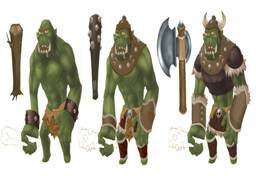 Green fur, strong muscles, sharp claws and a bare head gives them a very fierce look. They have an eagle's head and 4 claws. They always equip simple armor and a fearsome spears. All birdmen are first rate warriors who never shy from battle. Some stronger ones are equipped with a silk gown and a wand which they use to wield powerful spells. 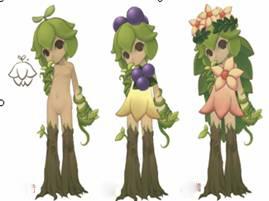 Vines, branches and leaves intertwine to form a cute body for these elemental fairies. They can even decorate themselves with flowers and fruit. A lot of broken statues can become infused with the power of evil and transform into evil ghosts. They are not as powerful as they look because their arms and wings are broken, but their fierce red eyes betray the power that infuses every part left in their bodies. As they become more powerful their broken parts grow longer and more jagged. They have fins on their back and gills near their ears. They are amphibious monsters with a human body and fish tail. They are slimy and wet and prefer cruising the sea to being among the air-breathers. Naga Warriors always attack others with their trident while Naga Priests always have a wand on their hands for casting spells. 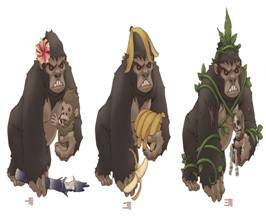 Female orangutan's has a flower on its head, a baby orangutan in one hand and some sugarcane in the other. Male orangutan's always have a bunch of bananas in one hand and a peeled banana in the other. The orangutan king is covered in vines marking his status and carries a female skeleton in one hand. It seems that it loves her very much even though she has obviously been dead for a long time. They have decorative designs which look like eyes on their wings.